On Friday, July 15, 2011 at 1409 Hours (2:09 PST), seven Companies of Spokane Firefighters, four engines, two senior ladders, one heavy rescue under the direction of Battalion Chiefs Brown and Fielder responded to a Civilian Fatality Structure Fire at 4128 East Princeton Avenue in Spokane's Northeast Side. Firefighters arrived quickly to discover heavy fire showing from both sides of the single story, double-wide trailer residence. The initial radio report indicated that the residence was over 50% involved in fire. Additionally, vehicles and other assorted combustibles were identified as exposures due to their close proximity to the quick-moving fire. Firefighters from Engines entered the structure using pre-connected hand lines and mounted a quick, aggressive assault on the fire. Simultaneously, Ladder companies provided ventilation of heat and smoke from overhead and searched the interior for reported persons missing within the confines of the home. During fireground operations, additional Fire and EMS resources were ordered and the alarm was upgraded to a working fire which added supplementary resources to assist in the search and management of the incident. During the initial phase of fire extinguishment, Firefighters searching the residence discovered the remains of an elderly adult in the area of heaviest fire damage. The victim was declared deceased at the scene. Multiple animals still remain unaccounted for. The swift moving flames, which spread throughout the home, was ultimately confined to the structure and extinguished in just 15 minutes. No additional injuries to civilians or firefighters were reported. The cause of this incident remains under active investigation by the Spokane Fire Department's Special Investigation Unit. The victim's name has not been released pending positive ID. Monetary loss from the fire is still being determined. The presence of smoke alarms and possible functional status and warning role has not yet been determined. On Thursday, July 14, at 02:27 AM, the Spokane Fire Department responded 4 Engines, 1 Ladder, 1 Heavy Rescue and 2 Battalion Chiefs to a reported structure fire at 4927 N Cook. SE15, which is located in the Hillyard Neighborhood, arrived within 4 minutes and reported smoke coming from a 1.5 story, wood constructed, single family residence. They talked with the home owner who said he had a fire in his upstairs bathroom and that everyone was out of the house. SE15 advanced a preconnected hose line off of their apparatus and advanced into the house to attack the fire. As additional fire companies arrived they searched the house to ensure everyone was out, removed the smoke, and made sure the fire did not extend from the bathroom. Their efforts were successful as the fire was quickly extinguished with confinement to the bathroom and a small area of the roof. There were no injuries to civilians or firefighters. There were no working smoke detectors in the home and the owner was very fortunate to have awakened before being overcome by the smoke. The fire was caused by an overheated fan motor in the bathroom ceiling. Structural damage was confined to the upstairs bathroom and part of the roof, with moderate smoke damage throughout the upper area of the house. 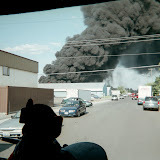 On Sunday morning July 3rd 2011 at 02:24AM, 6 Companies of Spokane Firefighters, 4 Engines, 1 Senior Ladder and 1 Heavy Rescue under the direction of Battalion Chief Bill Donahoe and Dave Haworth responded to a reported structure fire at 4236 East Hartson. The first company to arrive reported nothing showing from the exterior of a single family dwelling. When the engine company made entry to the home they found the first floor charged with smoke. Companies then advanced an attack lead and extinguished a cooking fire on the kitchen stove. Other companies were assigned to search, ventilate, and check for extension of the fire. All occupants were accounted for and the fire did not extend beyond the stove. There were no injuries to Firefighters although one occupant was transported to Deaconess for smoke inhalation. Kitchen stove and smoke damage to the first floor of the home.